Bradley, now of Lamar University, has been a stalwart leader of our Creative Writing Area. As an Area Chair, Jerry communicates with his writers early and often – and is always ready to share the limelight with others. At the meetings, he attends every session for the creative writing area, checking the water glasses and pitchers, making sure the AV is in order, and picking up stray papers from the previous session. In the evening, he invites writers to his room where Cowboy Kool-Aid is dispensed while guitars play and writers brag about their productivity and publication success. Bradley was our President from 1999-2001, and we are most grateful for the leadership he supplied during that period for the organization. We are most proud of Jerry Bradley, and we are delighted by the élan he has brought to our organization. Bridges’ warmth, charm, and leadership had bountiful results with our organization. Drawing from her graduate students and her peers in the Southwest, Bridges created an intense interest in biography, which remains as one of the associations’ largest and most energetic areas. As President, she made sure that all attendees felt welcomed and encouraged for their participation and for their intellectual insights. Bridges is a fine example of the Western woman – professional, active, ready to share insights and humor, and concerned about people. We cherish her involvement in our organization. 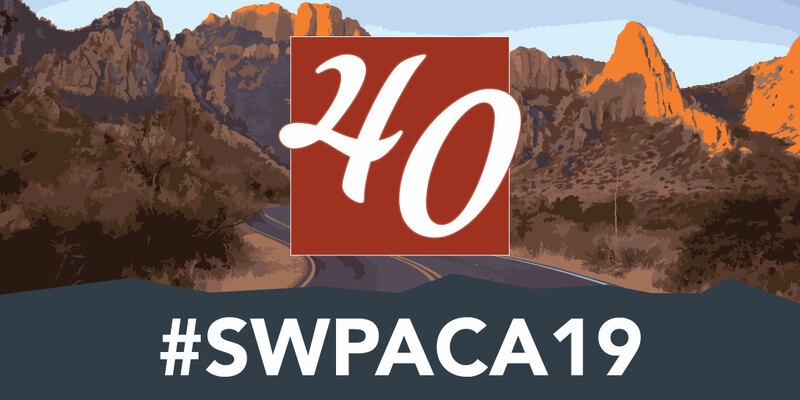 King attended her first Southwest/Texas PCA/ACA conference in 1994, where she presented her first conference paper as a graduate student, and she has been involved with the associations in a number of capacities since that time. In 1998, she served as conference co-chair along with Jill Talbot for the 19th annual meeting, held in Lubbock, Texas, for which she received the Ray Browne service award from the associations. For the 1999 meeting in Albuquerque, she was the conference host and served as webmaster for the conference from 1997-1999. She served as Area Chair of Film Adaptation 1998-2013 and is currently the Executive Director for the newly renamed Southwest Popular/American Culture Association. She is the co-editor, with James Welsh and Rick Wallach, of No Country for Old Men: From Novel to Film, and the author of the forthcoming Coen Brothers Encyclopedia (Scarecrow Press). Cox went to her first Popular Culture meeting in Stillwater at OSU. “A colleague and I drove from Amarillo College in an ice storm. When we arrived it was 6 degrees, and we headed for dinner walking across the campus and nearly froze. I met Peter and Ray and I did a paper on McMurtry’s description of Dalhart, Texas from his collection of essays In A Narrow Grave. I remember Ray complimented me when we had our first meeting at a pizza parlor.” Diana also served as the Conference Host in Amarillo, that then to date attracted a large crowd. For years, she has been a regular attendee at SW/TX PCA/ACA gatherings and at the National meetings. “I thought and still do think it is an incredible organization and has top notch folks.” Cox has also read entries for the Schoenoeche Award in American Culture for a number of years and given numerous papers on Texas authors such as Katherine Ann Porter. Board member and past President, she feels humble that the Board has named an award in her honor. Davis introduced an enthusiasm for the study of folklore in Southwest/Texas PCA. His graduate students attended with great regularity and won the Rollins Award for their outstanding contributions to the study of folklore. After Joe Graham took over as Area Chair for Folklore, Davis’s interest and expertise in Southwestern Literature produced another area that attracted a significant number of participants to the SW/TX PCA. As the membership is aware, Davis held his own with Peter Rollins and Harold Hatt as they battled one another with their puns. Duren became involved with the organization through his work with Dr. Rollins at OSU. He participated first in the National PCA/ACA and then became affiliated with the Southwest/Texas PCA/ACA when Dr. Rollins asked him to take over as Area Chair for the Oklahoma Culture Area in 1998. Since that time, he has continued to serve in that capacity as well as an Officer for the Texas PCA/ACA. Duren also serves on the the Governing Board of the National ACA and has participated in a wide variety of areas at the National meeting—everything from film and history to horror. He is now Assistant Professor of History at Oklahoma Panhandle State University in Goodwell, Oklahoma, where he recently finished his fourth year on faculty. He has penned articles and reviews for Chronicles of Oklahoma, Film and History, and Western Historical Literature among others. He served as historical consultant on the TLC documentary “Kent State: The Day the War Came Home,” which won an Emmy in 2001. His interests include American social/intellectual history, film, pop culture, religion and music. Dvorak actively became involved with the SW/TX PCA/ACA in 1997 creating the organization’s first web presence. He serves on the Executive Board as Treasurer and Annual Conference Planning Coordinator. He has served the organization in numerous roles including past Area Chair for Distributive Learning and the Internet Classroom and American History & Culture. Ken worked with the national PCA/ACA organization serving long time H-Net discussion list moderator (1995 – 2002), web editor, Vice-President, and President of the American Culture Association. He is a recognized expert in Distance Learning and has earned an award as a Master Online Instructor. His publications have appeared in Film & History: An Interdisciplinary Journal of Film & Television Studies and The Journal of American Culture and History Highway: A Historians Guide to WWW Resources. He is the co-editor with Julie Anne Taddeo of The Tube Has Spoken: Reality TV and History (UP of Kentucky, 2009). Foley is an associate professor of fine arts at Rogers State University in Claremore, Oklahoma. His scholarship and video work focus on the music of Oklahoma and a variety of issues relating to American Indians in Oklahoma. Foley first became involved in the SWPCA when he asked Peter Rollins to be his advisor in the graduate program at Oklahoma State. Dr. Rollins said, “Okay, but what are you going to do for me?” As a result, Foley was the Conference Coordinator of the 1995 and 1996 annual meetings in Stillwater and Tulsa, respectively. Since then, Foley has published numerous poems, magazine articles, encyclopedia entries, a book chapter, and started a folk rock band. Along with producing an acclaimed video documentary on the use of American Indian mascots in Oklahoma high school football in 2003, he has written the Oklahoma Music Guide and the Oklahoma Route 66 Music Guide for New Forums Press. If at all possible, Foley is a regular participant and presenter at the annual SW/ TX PCA/ACA Conference, usually in the areas of Native American studies, music, or film. Garrett was responsible for planning the program in Waco, TX in 1994. He attended his first meeting in 1989, and for some years participated in SWPCA as Chair of the Film section. More recently, he’s presented in the creative writing sections. He is a Professor of English at Baylor University, and author of the novels Free Bird and Cycling. Graham of Texas A&M–Kingsville has retired due to ill health, but has not been forgotten. Graham will be remembered for two reasons, the first of which is that he was never without his ice tea travel mug at the meetings—whether national or regional. Second, Graham ranked up at the top of the list as a professor who cared about his students and who encouraged them to bring their work to the regional meetings. Every year, he would appear with three or four panels worth of back-to-school students who, under his tutelage, had developed papers on folk medicine, folk crafts, folk stories—all from the Mexican-American community of Southern Texas. One of the early debates in then history of the popular culture movement involved the issue of the differences between folklore and popular culture. The issue always came to the surface during the Joe Graham panels: these people were down at the roots of both folk and popular culture, and the research was absolutely fascinating—and based on field work rather than library research alone. We will miss Joe Graham and the folk component which he brought to our meetings. Hatt retired in 2000 as the Dean of the Theological Seminary of Phillips University in Enid (now located in Tulsa). What made Hatt unique – other than his crew cut – was his interest in cinema as a source of theological themes. It is true that the world has caught up with this focus, but Hatt was there in the early 1970s; we honor him for his leadership as a film scholar. He added another component to our meetings – puns. Since Hatt qualifies as one of the most caring and compassionate people in the world, it was truly surprising to see him at a meeting walking around with a name tag which said, “Harold Hatt: Violence.” Of course, what was meant was that he and his colleague, Donald Heath (also of Phillips U) were on a session devoted to violence in film, but the initial impression was quite otherwise. Harold and Martha Hatt are part of our regional organization heritage, and we thank them for continuing to attend. Phil leaves behind a rich and honored legacy with the SWTX PCA/ACA, having seen the organization grow in numbers, influence, and recognition world wide as THE Popular/American Culture conference to attend. Phil joined the Southwest/Texas PCA/ACA in 1993 as a graduate student at Oklahoma State University. Over the years, he has served the organization in various capacities and pioneered several subject areas such as Creative Writing Pedagogy and Interdisciplinary Studies. He served as the SW ACA Vice-President from 1998-2000 and as President from 2000-2002. In 2002-2003, he began serving on the SW PCA/ACA Executive Board as the Executive Director. He is the author of numerous articles in American literature; the author of Good Friday (Texas Review Press, 2000), Winner of the X.J. Kennedy Poetry Prize; and the Winner of the Mid-List Press First Series Award for Creative Nonfiction for his book, Out Here in the Out There: Essays in a Region of Superlatives (2005). Herrera served as our President for the years of 1995 to 1997. In that role, he brought to us the eye of an artist and the language of a poet. Herrera appointed himself to be our official photographer and has captured the history of our organization in images over the years. Many of us have valued special photography which Mario collected in Latin America and shared with us. At regional meetings, he organized sessions on photography and the Southwest and was also directly involved in the poetry and creative writing sessions. A master of the arts and of many cultures, Herrera is a proud example of the Renaissance man. It is also true that we have valued and appreciated the personality and spirit of the lovely Rosita, his much beloved wife and our friend. Taylor and Overmeir of the University of Oklahoma Library have been an important team for the regional group, bringing buoyant spirits and AV equipment to our meetings. As co-chairs of the Libraries and Popular Culture Area, they have planned and supervised sessions at each meeting, but their willingness to help make the meetings a success has always been appreciated by the officers and the local arrangements cadre. Any meeting of officers or Area Chairs is a more pleasant experience when these two spirited ladies attend. Not to be forgotten have been their efforts as the organizers of The Brother Paul Society, a group dedicated to celebrating the work of satirist Paul Somerville of Moore, Oklahoma and a neighbor of the OU Campus. We are eternally grateful to these loyal members of our association. Rollins is Emeritus Regents Professor at Oklahoma State University where he has been located since 1971 and is now in retirement (2011). He is the Founder of the SW/Texas Chapters and, in the early days, linked our meetings to the OSU Filmathon, a film festival which he started in 1973 and which continued as the dray horse for our meetings for the next twelve years or so. When video cassettes replaced 16mm films as the industry standard in the classroom, the Filmathon lost its special niche, and the regional PCA/ACA took on a life of its own. Graduate students from the OSU stable have provided considerable horsepower for the organization. Liberal Arts) provided leadership for a number of meetings and moved on to a successful career in New England. Zia Hasan (Claflin U.) was a Director of the meetings for two years and moved off to greater glory in the South. Michael K. Schoenecke was a Director of the meetings and stayed in the region to provide increased and continuous leadership over the years. Hugh Foley (Rogers State U) added his gift of organization for both a Stillwater and a Tulsa meeting—where Phil Heldrich stepped in to assist. Of all the accomplishments Rollins counts in his career, working with such wonderful people—and training them along the way— has been most fulfilling. They are all leaders in their institutions and their work with the Filmathons and Southwest/Texas PCA/ACA meetings were the training grounds for their successes. Reed Harp and others have been very helpful over the years with the Proceedings for the organizations, an effort which has provided a paper trail along our frontiers of scholarship. Every institution consists of people and these people have been inspiring companions. Details about Peter Rollins’ scholarship can be found at www.petercrollins.com. His capstone book, America Reflected: Language, Rhetoric, Film, and the National Mind (New Academia) is now a Google book and available on Amazon.com as a Kindle book. It is his goal to put this collection of his best essays on the shelves of all major American research libraries in the United States. Susan Rollins literally married into the organization in 1992. “Peter took me to Amarillo in 1992 to my first Southwest PCA meeting where I met Mike Schoenecke, Diana Cox, and many others who were active in Texas/Southwest regional chapter of PCA/ACA. Soon I was ‘hooked’ into the ‘culture’ and participating fully in the events. “She received a Bachelor’s degree in Special Education in 1963 from Lesley College, Cambridge Massachusetts, now known as Lesley University. She spent most of her working years in the business arena in sales and marketing, and eventually moved into a series of management positions in the employment industry—almost all in Massachusetts. “When Peter and I married, I had attended a regional meeting with him in Las Vegas, and had heard of all his activities on the national level as well as the Southwest area. I was not surprised to find myself getting involved where needed in the early years of 1993 up to about 1996. When the Southwest/Texas PCA/ACA meetings moved to Albuquerque, NM, somehow I became more involved, first with the registration element and eventually with the handling most of the details of hotel arrangements, speakers, luncheon planning, registration payments (PayPal), nametags, program design and printing. I was doing just about everything but making beds daily at the hotel! “When the meeting moved from the Sheraton Hotel in ABQ to the Hilton, the organization took a big leap forward. In 2002, when Peter had his first heart attack, Susan still conducted the planning and structure for the meeting without attending it, with the able help of the aforementioned Michael Schoenecke, and additional help of Phil Heldrich, Ken Dvorak, Leslie Fife, Deb Carmichael, Brad Duren and many others. At one of the meetings, Susan met Steven K. Gragert, Director of the Will Rogers Memorial Museums (Claremore, OK). As a Docent at the Gilcrease Museum in Tulsa, Susan had discovered the importance of guides to enhance the artistic and historical dimensions of such facilities. Together with Steve and other members of the WRMM staff, she designed a 14 week course for docents, eventually turning out 3 classes or a total of 39 graduates. Susan Rollins died during the summer of 2011 after a 6.5-year struggle with cancer. Photos, tributes, and obituary are at www.susanrollins.net In 2012, the Southwest/Texas PCA/ACA created an award in her name—to be conveyed to a deserving conference paper in Museums Studies and Public History. Sanchez served as the SWTX Conference Coordinator (2003 – 2012) taking over from Leslie Fife and Susan Rollins. Sally was instrumental in helping move the presenter submission and conference registration process from the “paper/typewriter” era to the organizations highly successful electronic submission formats. She is best know for keeping tabs on “her” Area Chairs keeping in touch with them (with the help of Phil Heldrich) throughout the year handling volumes of emails diligently responding to each one. Her tireless efforts and constant smile left its mark on all who had the pleasure of meeting her during our annual conferences. Schoenecke has been a teacher at Texas Tech since 1981. For the last five years, he has been the Secretary/Treasurer of this organization and has hosted four conferences in Lubbock, Texas, the home of Texas Tech and the 1999 Albuquerque meeting. Much of our success in the Albuquerque meetings has stemmed from the reliable, hard-working efforts of Schoenecke. He is up at 5:00a.m. each day, rolling AV carts out of his room and down the hall to the elevators. With his trusty AV schedule in hand, he places the right equipment in the rooms to get the day started and then briefs his helpers about the coming responsibilities. Nervous presenters approach him while he maintains his cool – even when they argue for equipment that is already in their room for their use. He has dealt with the hotels and staff, and his low-key, friendly – but efficient – manner has been one of the keys to success for our meetings. What needs to be said is that these efforts have been going on for the organizations for 20 years – not just for one meeting. At the invitation of Peter Rollins, Richard Tuerk started the Science Fiction and Fantasy area. He also served as president of the SWPCA, but to be honest, for him, the position involved little work. He even missed one of the conferences over which he was to preside because he had pneumonia. He was greatly relieved when Ximena Gallardo C and Jason Smith took over as chairs of the area because he knew that the area would then be in good hands and that it would continue to grow. He is now a professor emeritus of literature and languages at Texas A&M University-Commerce. He is delighted and proud to have the Richard Tuerk “Out of This World” Paper Award for Science Fiction and Fantasy award named after him.